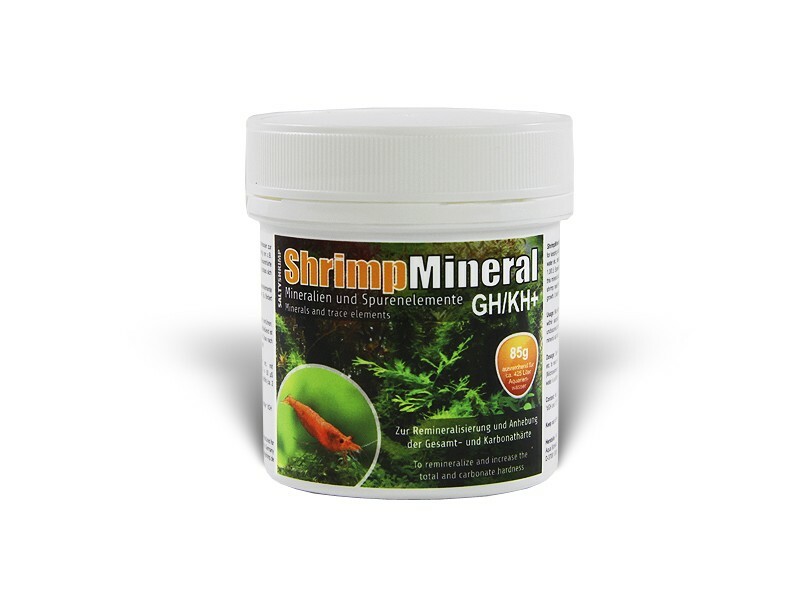 Shrimp Mineral GH/KH+ has been especially designed for the preparation of neutral aquarium water for keeping and breeding shrimp. It re-mineralises e.g. RO water, rainwater, fully desalinated water etc., raising total hardness (GH) and carbonate hardness (KH) at a ratio of GH/KH: 1.0/0.5. Especially shrimp from habitats with a neutral pH do very well in water prepared with this mineral salt. Shrimp Mineral GH/KH+ contains all the important minerals and trace elements your shrimp need for their well-being, an intensive colouration, successful breeding and healthy growth. It also furthers plant growth and the microbial regeneration of biological filter substrates. Mix with water outside of the aquarium. Shrimp Mineral dissolves almost completely within seconds, and the water is ready for use at once. Please make sure that any undissolved particles go into your tank, too. Close container after every use at once as this mineral salt absorbs moisture. Use Shrimp Mineral to re-mineralise RO water, rainwater, fully desalinated water etc. to reach a total hardness of about 6 GH and/or a conductance of about 300 +/- 50 uS (Microsiemens). For this purpose, an evenly full measuring spoon (about 2 g) to 10 litres of water is sufficient.